The new library at the Suffolk County Community College in Brentwood, New York, has an aluminum and glass curtain wall. The Learning Resource Center provides a collection of study spaces organized around a dramatic social stair. A simple mass of nine cubes arranged in a 3 x 3 grid accommodates the library program on two floors. Portions of the cubes are either removed or expanded to create an interplay between negative and positive spaces. This allows the resource center to act as a prism casting sunlight deep into the space throughout the day. A central lantern rises above the building to create an iconic expression on the campus skyline. The library provides a variety of learning environments, such as group study rooms, seminar spaces, computer and open tutoring classrooms, and a 100-seat lecture hall. At the heart of the building, beneath the lantern, lies the information commons to accommodate computer workstations, technology, and reference help desks, and casual reading areas. The center for academic excellence is on axis with the information commons and flanked by the college’s writing center. The college’s boardroom, faculty athenaeum, offices, and reading room occupy the second floor, as do the library stacks lined with carrels for individual study. 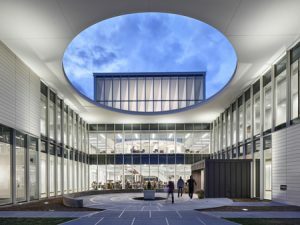 The building enclosure consists of an aluminum and glass curtain wall and white terra cotta, a departure from the red clay brick typically found on the campus, to express the primacy of this learning center. A ventilated rainscreen façade, green roof, and photo optic lighting controls are a few design features that incorporate a sustainable approach. The project has received honors and accolades from professional organizations and awards programs, including the Chicago Athenaeum, the Architizer A+ Awards, the Society of American Registered Architects (SARA), and various chapters of the American Institute of Architects (AIA).